I’ve been wanting to get my hands on a Nina LaCour novel for quite some time now. After I heard her talk at YALC alongside David Levithan, I wanted to see how she would approach her own novel. Her debut novel is Hold Still, and sets up her career brilliantly. The story itself deals with some quite difficult topics, suicide, self harm and loss just to name a few. I’ll get it out there fast, that this book is quite triggering, with very little warning about it. If you’re sensitive to any of these topics, I don’t think this would be the book for you. That said, these topics are dealt with gracefully. LaCour gives a true portrayal of losing someone to themselves, to dealing with the loss of a friend and the knock-on effect that has with your life. The best thing about this novel for me way the way that LaCour easily wrote about Ingrid, a character who was not present in the novel. She gave a wonderful interpretation of her personality, without having her around, and I’ve found that’s a very difficult thing to get right while writing. This was one of the best interpretations I’ve seen of this being done. 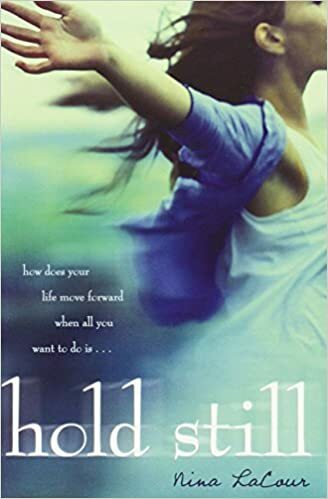 I really did enjoy this novel, there are some YA tropes that I’m sure are looked down upon by many people, and in some aspects, I didn’t think a romance was necessary. It felt a little forced sometimes and seemed to come out of nowhere. But the friendship aspects of this story were enough to make my heart leap with joy. Some parts to Hold Still do feel slightly cliched, but I’m struggling to find a YA novel that isn’t anymore. I’m going to come out and say that i absolutely adore illustrations within novels. I know that is not something for everyone. Novels such as A Monster Calls are expected to have illustrations along with them now. However, Hold Still had some beautiful and unexpected illustrations. Not many, but some images that were from Ingrid’s journal were dotted around this novel, and enhanced the reading experience for me. I really did enjoy this aspect as it was not expected at all. Hold Still is worth a read for anyone. The themes that are discussed enlightened me to many things regarding loss of friends, how families deal with it and just how difficult life can get as a teenager. It’s a wonderfully written story and I’m very glad I took the time to read it.